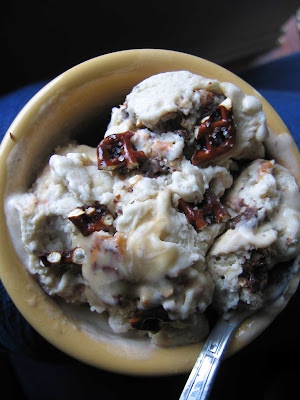 Did you read my post about the Almond Cherry Ice Cream with Chocolate Swirl? The short story is that the temperature was below zero and I wanted ice cream. Not being able to decide between two flavors- I choose to make two. Take 1/3 of the base from the Almond Cherry Ice Cream, and continue below. (If you decide to only make one ice cream, use the whole base of the custard from that recipe, and double the ingredients below. A couple of items to note- if you're making your own chocolate covered pretzels, you need to fully cover the pretzels in chocolate or they will get soft. Also, add lots of salt on top to for that great sweet-salt mix! Take 1/3 of the custard mixture from the Almond Cherry Chocolate Ice Cream. In a blender, add 2 ripe bananas and blend until smooth. Add in the custard and blend for a few seconds. Pour into your ice cream maker and continue as manufacturers directions. Have about 1/2 cup of creamy caramel and about 10 chocolate covered pretzels ready. You can use jarred caramel, but I have a super fantastic - foolproof caramel recipe here! As you put the ice cream into a container for your freeze, add the caramel swirl. 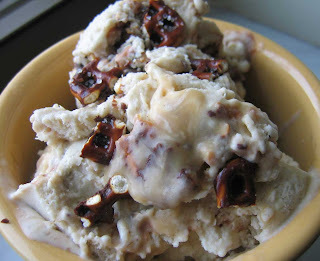 Simply place a big scoop of ice cream in the container, and then drizzle it with caramel and and chocolate covered pretzels. Now add another layer of ice cream and another drizzle of caramel and ch ocolate covered pretzels. Continue in this manner until complete. Enjoy! You must completely cover the pretzels in chocolate and then salt them- I used my pink salt for this. 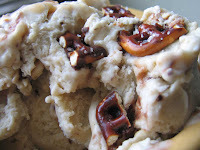 If you don't totally cover these pretzels in hardened chocolate, they will begin to soften in the ice cream. Just melt some chocolate chips, (don't add cream or anything, as you want the chocolate to be hard) dip the pretzels in the chocolate, shake, and place on a piece of wax paper. Sprinkle heavily with larger salt crystals.